In my last post, I shared the "words" mini quilt that Sonja sent me. 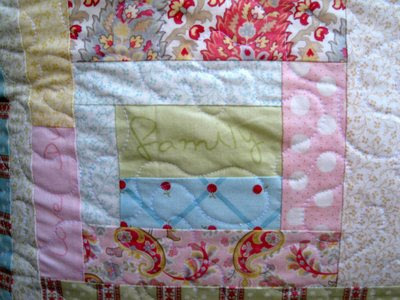 Since then, I've received word that she has received the quilt I sent her, so it's safe to share! Originally, I wasn't going to participate in the "words" swap because I was intimidated by trying to piece letters, which is what I thought most people were going to do. 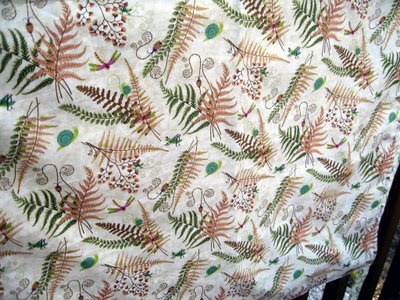 But then I came across some fabric that completely inspired me, and signed up for the swap in the nick of time! The fabric is from the "Simplicity" line by 3 Sisters for Moda and, despite my terrible photos, I hope you can see the words printed on the fabric. The fabric design features words like "Home", "Peace", "Dwell", and "Harmony". As soon as I saw it, I knew what I was going to do. 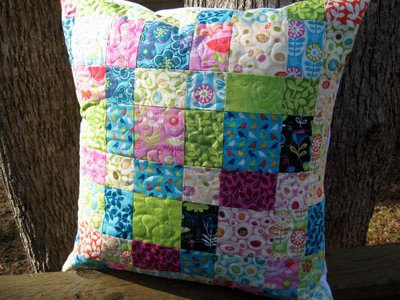 I've been really inspired by some of the free pieced quilts I've been seeing (and receiving! 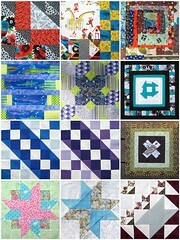 ), the "Collaborative Quilting" book, and bloggers like Sarah and Tia. In particular, take a look at the blog header at the House of Krom, and you'll see the vibe I was going for. See the words in the trees? "Love", "family", "dance" and "celebrate". 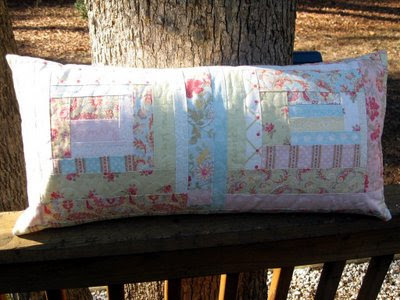 Who wouldn't love a quilt with such happy words? I know I'm late to the party because it seems like this line is on its way out, but "Simplicity" is a really beautiful fabric line. Once I decided on the concept and the fabrics, everything fell into place. In fact, other than the fabric featuring the words, this quilt is made entirely from scraps that I got from Emily after she finished her daughter's bed quilt!! 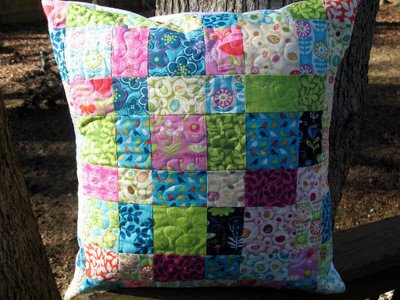 I've been getting a lot of mileage out of those scraps -- including some of the pillows I made for Christmas gifts. Thanks, Emily! The best part is, I think Sonja really enjoyed receiving this little quilt. I had a hard time getting good pictures of these fabrics because they're so soft and muted, but Sonja's pictures are much better. 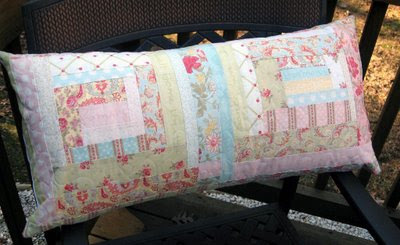 Take a look to see where the quilt is living in its new home! OK, we'll come back to that in a minute. Back in November, the theme for the 6-12" Mini Quilt Swap was "words". My fast friend Sonja and I were both so indecisive about signing up for it that we missed the boat and partners were assigned without us. Well, we decided to pair up and swap with each other. And we also decided to waive the month-end deadline, make it through the holiday season, take our time and have fun with it. Well, I received my package from Sonja this week and, boy, was it worth the wait! Check out that package!! Let's take a closer look at what's in there. Some nautical fabrics and matching ribbon. Sonja's incredibly thoughtful note said "For Mrs. Quilt Dad ... May you always be inspired to sew. From one working momma to another." Kiely was touched! Let's see ... what else was in there? ... flower elastics for my twin girls and other assorted gifts. Were we spoiled, or what?? And, oh yeah, there was a quilt in there, too! Wanna see it? Sonja reimagined my funny-faced photo as a Japanese-style brush painting! Isn't this amazing?? I was truly blown away. Sonja included tigers in the quilt's border, since I was born in the year of the tiger. And, she trimmed the photo with some three-dimensional piping. 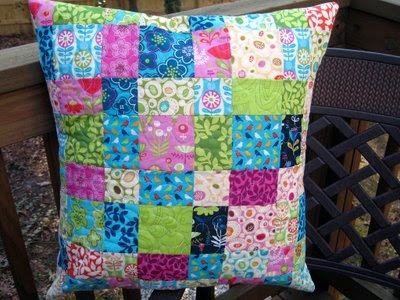 The quilt is backed in a wonderfully intricate Asian print. And here's the quilt's label. You'll notice that Sonja translates the Kanji characters on the front of the quilt ("John", "The King of Kindness", and "Artist Sonja"). How incredible is that? It's so thoughtful and so personal, and I am truly grateful. Sonja, thank you so much. I am so lucky to have gotten to know you and to be exposed to all of the great work that you do. Your creativity is always inspiring ... I hope this isn't the last time we have the opportunity to swap! I've been keeping busy making blocks for my Craftster swap. With the deadline fast approaching (some time around Valentine's Day), I've tried to make this top priority and clear it out of the queue! I'm really happy with many of these blocks so far ... and I think I've shown a lot of progression since the last swap. If nothing else, I'm able to make the blocks a lot more quickly! 12 down, 10 more to go. And over at SewConnected 2, Kimmie selected a beautiful set of batiks. Like Tracy's silk, I've really never worked with batiks either ... but I love the way all of the colors work together. I recently got my hands on a copy of the Collaborative Quilting book that's often discussed in the quilting forums, and it inspired the bit of spiky border that's along the bottom of the block. The group is making a really gorgeous set of blocks for Kim -- check them all out in the group pool! While on the topic of virtual quilting bees, I really love surfing around and seeing what everyone in the other groups is putting together. I've been particularly inspired by a couple of fabric selections recently and wanted to give them some props here on my blog. A disclaimer: I haven't individually asked these quilters if I could post their pictures on my blog, but I am hoping that fully citing them with links and such will suffice. I apologize if this is poor blogger etiquette -- if you ask me to remove your pictures, I'll gladly do so! In the new group A Notion or Two, mommyandbeyond recently compiled an amazing selection of greens. I'm a fan of so many of these fabrics individually, but never would have thought to put them all together. SO great, Amy -- I might have to "borrow" this pallette! I really enjoy following the action over at Common Threads, too. So many of my favorite quilt bloggers are in that group. 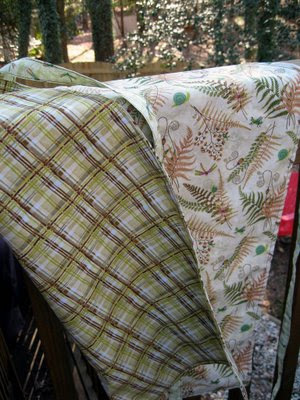 I can't stop thinking about the fabrics that Lady Harvatine put together back in July. SO cool, Liz! This color scheme is really me. 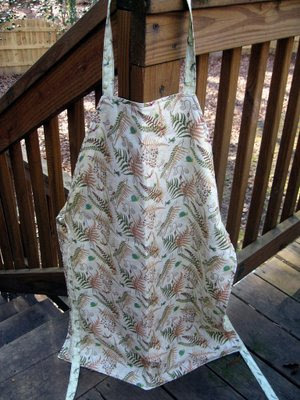 Oh, and the Joel Dewberry chestnuts at the bottom is one of my all-time favorite prints from one of my all-time favorite fabric lines. And most recently in Common Threads, blempgorf sent out a muted selection of solids and stripes that just work soooo well together. Jenny called them her "sad" fabrics, but they're far more inspired than sad to me. I'm also pasting in some of the blocks that have already been made from these fabrics -- it seems that the other quilters were inspired, too! 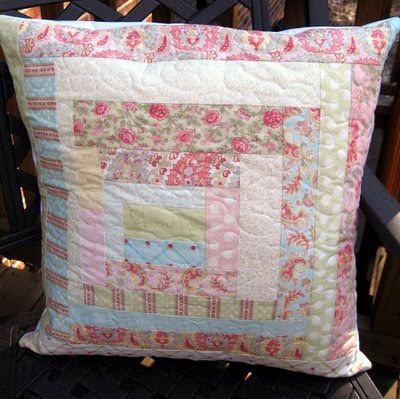 (Quilted, in order, by Rebekah, one shabby chick (Amber), and one shabby chick (again)). December was such a crazy month in the Quilt Dad home that I just realized I forgot to post about some of the things I received leading up to the holidays. So crazy, in fact, that I even took pictures of these things, uploaded them, and edited them ... then promptly forgot all about the final step of blogging about them. Until today. First up, I received the giveaway prize from Michelle that I had previously blogged about. Along with the four embroidered squares, Michelle sent some additional festive holiday fabric, ribbon, and chocolate (yum!). The four charm packs pictured are my own, shown here because I think I will combine the sweet embroidered Santas into a quilt with these Merry & Bright and Holly Jolly fabrics. 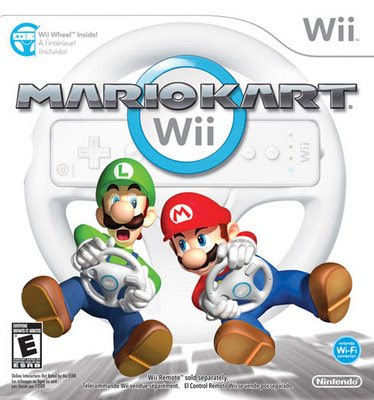 For 2009. Maybe. Sharon sent an adorable little holiday quilt, "First Snow", that was prominently displayed in our living room throughout the season. Check out those awesome little snowflake button embellishments! Sharon included some great extras, like those homespun patches shown above. I can't wait to find just the right project to use them. Suggestions welcome! Finally, there aren't too many of us guy quilt bloggers out there, so I want to be sure I support one of my cohorts. I believe all of us straddle the line between quilter and artist, with some falling more on one side of the fence than the other. Scott over at Blue Nickel Studios is one of those quilters for whom I believe the ARTIST side is immediately apparent. 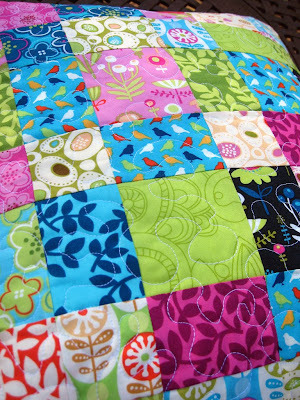 He's been making some really great quilts and quilt patterns lately for the nice people at Free Spirit fabrics, including new designs for Jay McCarroll and Anna Maria Horner. 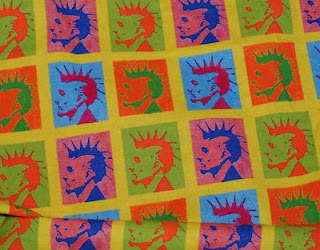 One of Scott's fabric designs, "Punk Andy", is in contention for Fabric of the Week over at Spoonflower. Please take a look and CLICK HERE to vote and support Scott in his new endeavor. 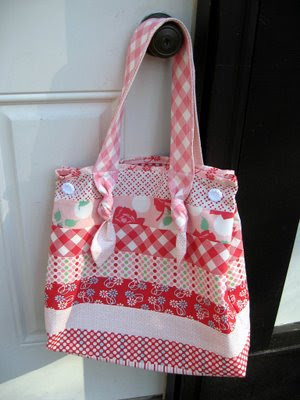 But after spending months eyeing all the beautiful fabrics John has purchased -- and all the fun, wonderful swaps he has participated in -- I finally got motivated to come back to my sewing machine. First, I had to kick John off the sewing machine (not an easy task -- do you guys know that he is 6'4" and built like a football player??) Then, I had to push aside all the quilting projects stacked on our ironing board (also not an easy task -- what have you guys lured him into??) And finally, I convinced John to do our regular runs to Target and various other Christmas errands with all three of the kids so I could have some peace and quiet to work. I'm heartless, right?!? 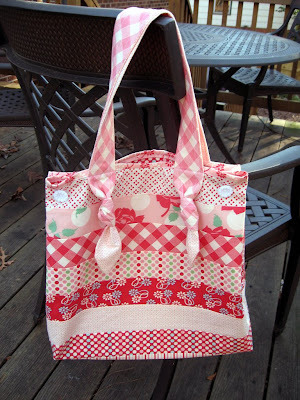 I've had this pattern for a coloring tote for a long, long time. 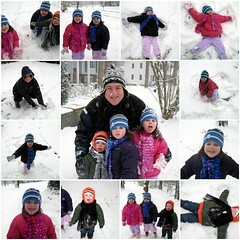 I decided it was the perfect Christmas gift for the kids. Purple kitties for our Bevin, pink bunnies for Megan and puppy dogs for Sean, of course. Well, if the truth be known (because I know John would insert an editor's note here if I tried to claim otherwise), it had been so very long since I did any quilting that I asked him to do the initial quilting to save me some time and frustration. He's gotten so good at it (and so fast) that I needed him! Here are pictures of the final products. They were very easy to make -- even for a rusty old sewer -- and the kids have enjoyed using them.....despite their initial reaction on Christmas Day to say "thank you" and then promptly throw them to the side. But, I'll just chalk that up to toddler Christmas excitement. I'll keep you posted on future sewing adventures. I still have a quilt for my sister that I need to finish up (promised to her last year for her birthday). All that's left is the binding and I'm so rusty that the thought of it makes me want to bury my head in my students' papers! I'll have to get John to give me a refresher course. SewConnected 2 | We've expanded! I've had a blast pulling together the SewConnected group these past few months. We've got a really talented, friendly and fun group of people creating and swapping blocks and, with only two months under our belts, I've already seen some awe-inspiring work. The response to SewConnected was so great that I quickly realized that there was enough interest in the idea to form a second group. A few emails later and SewConnected 2 was born! With a (mostly) new group of quilters, we kick off this month.